Auckland-based quartet Openside have added an extra date to their first, all-ages, nationwide tour. The group headlines The Seamless Tour will now perform a final show in Tauranga on July 20th featuring special guests DUNES . The tour is in support of Openside’s latest single ‘No Going Back’ which was released last month. 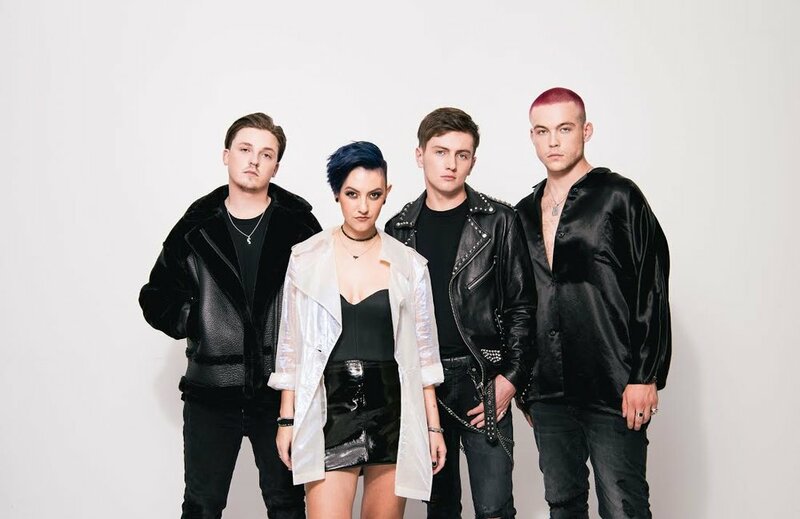 I caught up with Openside's singer Possum Plows following their Christchurch show to find out more about the tour, the new single and future plans for the group. You’re currently in the midst of the Seamless NZ tour. How have the shows been going? Yeah, we started in Christchurch and it was really good. I think I was a little bit nervous at first when we were planning this, because we haven’t headlined shows in lots of these places. So I was thinking ‘Who is going to come?’. And then it was just really awesome getting out there seeing all these young people, and they get really enthusiastic. When I talk to them afterwards they’re so grateful that people are coming to do these shows. So that’s a big part for us is giving people under 18 some fun music related stuff that they can do. So that was kind of the highlight for it for me. But it ran really smoothly. We had Nomad who are Christchurch play that show and they’re amazing. We’ve played a few shows with them before and they are always really lovely. It sounds like you have a really good camaraderie with Nomad as well as your other supports acts Drax Project, MAALA, Theia and Dunes. Yeah, that’s part of it too - creating a community of artists. It’s like a little sort of New Zealand music support bubble. You recently released your latest single ‘No Going Back’. How did that song come to be? It’s definitely a little bit different to everything else that we’ve put out. It’s more raw and personal. I wrote it about a break up that I went through, it kind of felt that I needed to write it to get closure of leaving that relationship behind. It was written further down the road rather than just after the break up had happened. I was ready to put this in my past and move forward. We wrote it with Dave Baxter and Josh Fountain who produces a lot of songs. The three of us just sat in a room and I told them about a phone call that I’d had with my ex and we just wrote the whole song and recorded most of it exactly how it is on the finished product that day. Some of those songs if you have that inspiration they just kind of write themselves real quick, and that was one of them. It’s accompanied by a fantastic music video. Who was behind that? That’s Shae Sterling who is amazing. He did our ‘I Feel Nothing’ video as well, and he’s a friend of mine too. He knew my relationship quite intimately, so he and I kind of worked collabarately on the video. And we’re working with him at the moment on our next video as well. He’s a very creative person who really understands what we’re about, which is awesome because I think the videos are really important because it takes a long time to get them right. Have you got plans for future recordings? Yeah we have a lot songs and I think we’re just trying to work out what the best way of delievering them is going to be. But there is definitely going to be a pile of songs before the end of the year, which I’m really eager to get out because we’ve had them for a while. You’ve supported some amazing artists, who have some of your favourites been? Fall Out Boy was the most recent one, and that was probably one of my favourites because they really were like the band that got me in to writing songs and playing in bands. So that had been a goal of mine for a really long time. That was a really special show. One of our early ones was with Twenty One Pilots when they played at the Powerstation. It was like right before they blew up and became this really huge act. We were pretty new then and I think only had one song out and they were just so kind to us and were really down to earth. That was also where we made some die hard Openside fans thanks to that show; because we have made a big chunk of our following just from playing supports. I find that people who go out to those shows tend to be open minded and generous They’re not just waiting for you to get of the stage so they can see their favourite band, they’re really excited for the whole evening. That’s been a really special thing for us and how we’ve made our fans. Following this tour, what’s next on the agenda for Openside? We’ve only really focused on New Zealand so far, so we’re looking at touring around Australia and the rest of the world. A lot of that will come from putting out more songs and making more music videos. It’s just kind of the grind. So just escalating what we’re already doing then taking it overseas.